In 2012, there were 369 fatalities from construction injury falls. Most of us would assume this number of deaths would be declining as we evolve and learn more about safety measures and protocols. However, that’s just not the case. In fact, these statistics are on the increase. If survived, construction workplace falls are extremely painful for the injured victim and very expensive for all parties involved. When employers cut corners on safety, they are jeopardizing the lives of many and harming hard-working families. Employers must be held responsible for implementing provisions to protect their employees from falls. As a construction worker, it is important for you to understand how most falls occur in the construction industry. You need to be aware of the rights you and your family have, should you ever become injured or killed on the job. Although studies show time and again that using guardrails, fall arrest systems, safety nets, covers and restraint systems can prevent many deaths and injuries from falls, many employers neglect these safety precautions. Guardrails – OSHA requires employers to provide fall protection by placing guardrails around the hazard area, deploying safety nets, or by providing personal fall arrest systems for each employee. Fall Arrest System – Fall protection systems can consist of devices that arrest a free fall or restrain a worker in a position to prevent a fall from happening. The systems restrain the elevated worker and prevent them from getting into a hazardous position where a fall could occur. They often include harnesses or belts, connection devices and tie-off points. Safety Nets – Safety netting prevents fall hazards when used properly. Netting should be utilized where loose construction materials, tools and equipment are present to prevent them from falling and injuring workers and pedestrians below the site. 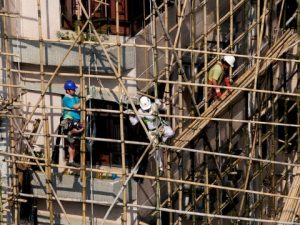 Employers should also use safety netting where there may be existing deterioration, and to catch workers who are susceptible to slipping and falling from various heights. Even if you are a construction worker who takes all necessary safety precautions, avoids unnecessary risks and wears the right equipment for your job, you can still end up with severe injuries while on the job. Your supervisor is responsible for keeping you safe, and when this fails to occur, you have rights and are due just compensation. At Parker Law Firm, we have the experience to aggressively pursue negligent employers and fight for your legal rights. If you have been seriously injured, or if you have lost a loved one as a result of employer safety violations, call us today for a Complimentary Strategy Session. We can accurately evaluate your personal experience and help you move on with your life. We are here to help. At the Parker Law Firm, People Matter.